Adult apterae of Trama rara are whitish to olive-brown (see first picture below). 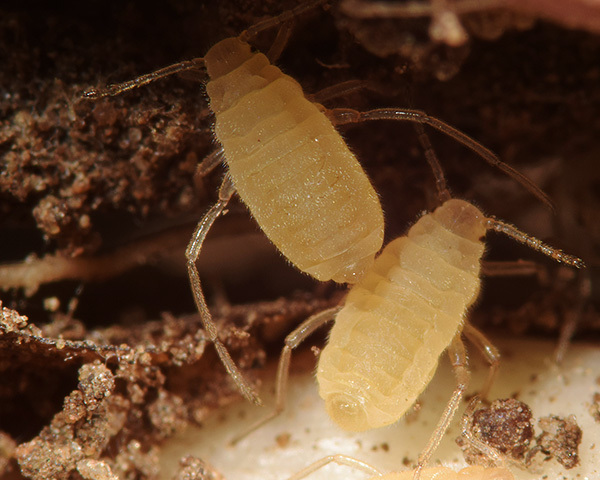 The antennae are slightly shorter than half the body length (see first picture above), with the terminal process about 0.22-0.25 times the base of the sixth antennal segment. 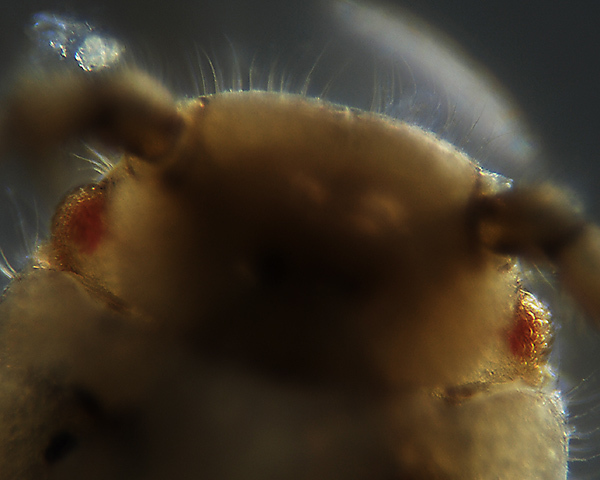 The eyes (see first micrograph below) have 25-50 facets (cf. Trama troglodytes where the eyes have only 3 facets). The second hind tarsal segment is greatly elongated (see two pictures above), being 0.84-0.92 times the length of the hind tibia (cf. Trama troglodytes which has the second hind tarsal segment 0.60-0.82 times the length of the hind tibia). 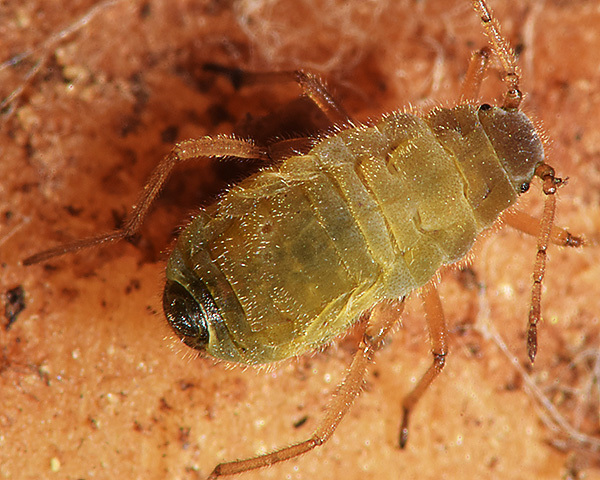 The adult Trama rara aptera body length is 2.5-3.5 mm. The Trama rara alate (see second picture above) has dark dorsal and marginal sclerites on the abdomen. This alate was newly moulted (one wing is partly fluid-filled) and had not fully darkened. The micrographs below show (first) the head & multi-faceted eyes of Trama rara and (second and third) dorsal and ventral views of a Trama rara aptera in alcohol. 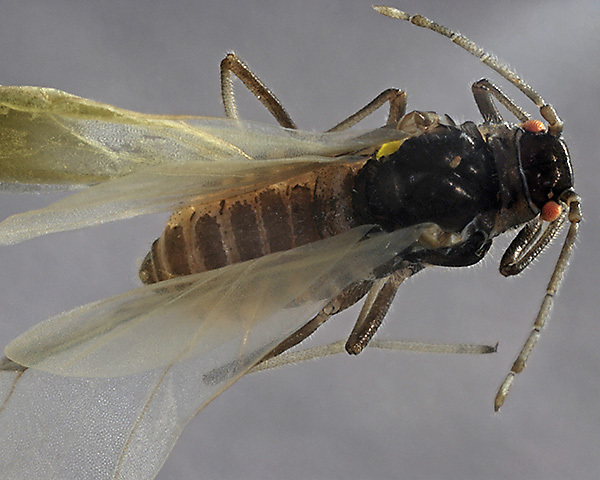 The clarified slide mounts below are of adult viviparous female Trama rara : wingless, and winged. Original micrographs of clarified mounts copyright Paul (1977). Trama rara live in ant attended colonies on the roots of dandelion (Taraxacum spp.) and a few other Asteraceae. It is found in Europe, parts of Asia and in North America. The image below shows a colony of Trama rara on dandelion. They are adopting their characteristic resting position with the hind legs held up in the air. The next picture is a close-up of two immature Trama rara feeding on a dandelion root. 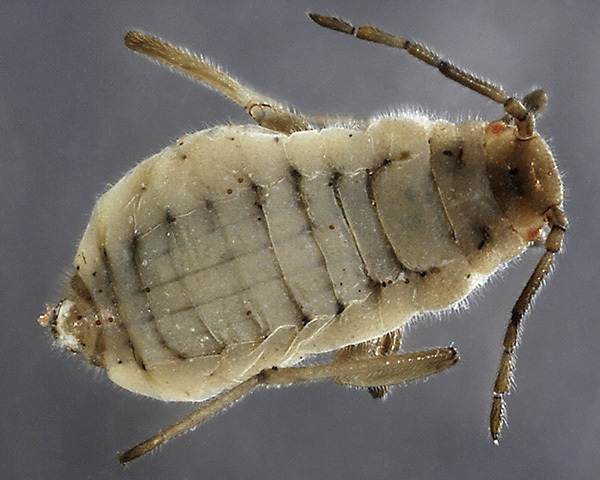 The next two pictures are a dorsal and ventral view of a Trama rara aptera in alcohol. In Trama rara (and other Lachnids) the perianal hairs (and many of the body hairs) are strongly recurved (Hille Ris Lambers, 1969).Such hairs could serve to retain small drops of honeydew to attract ants. 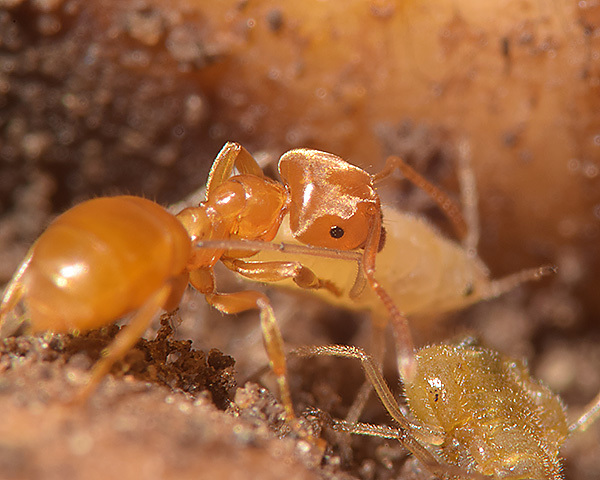 Trama rara is always attended by ants, as in the photos below by Lasius flavus. The species apparently cannot survive without ants, as without them it becomes coated with honeydew (Paul, 1977). Ants are known to pick up aphids and carry them. Paul (1977) observed this behaviour in a number of species of ants including Lasius flavus, Lasius niger, Formica aquilonia and Formica lemani Such behaviour has also been observed by other authors. However, Nixon (1951) and Pontin (1960) concluded that there is comparatively little evidence for transport to the host plant. Paul found that Lasius flavus failed to transport Trama rara from one empty chamber to another containing roots of Taraxacum officinalis. 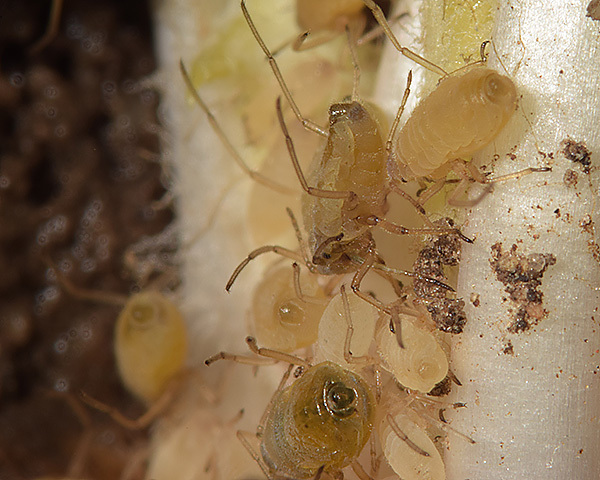 However, even if they do not deliberately transport aphids to their host plants, it is possible that random carrying of aphids may help disperse them around their host plant. 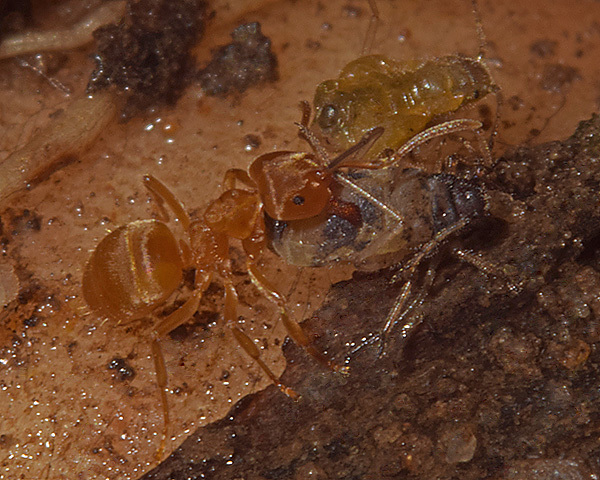 The images above show (first) Lasius flavus picking up a fourth instar immature of Trama rara in its mandibles and (second) carrying it. Trama rara has been recorded from 5 species (Taraxacum officinale, Taraxacum serotinum, Lapsana communis, Helianthus annuus, Helianthus tuberosus) plus unconfirmed records from several others. Blackman & Eastop list 36 species of aphid as feeding on dandelion (Taraxacum officinale) worldwide, and provide formal identification keys. 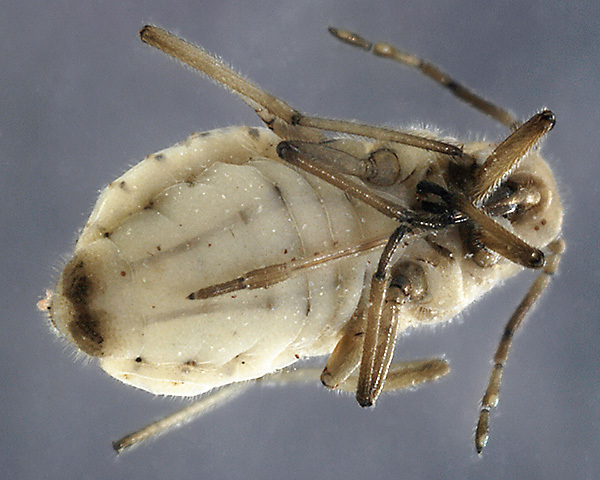 Of those, Aphis taraxacicola, Brachycaudus lateralis, Pemphigus bursarius, Trama caudata, Trama rara and Trama troglodytes occur on dandelion roots. 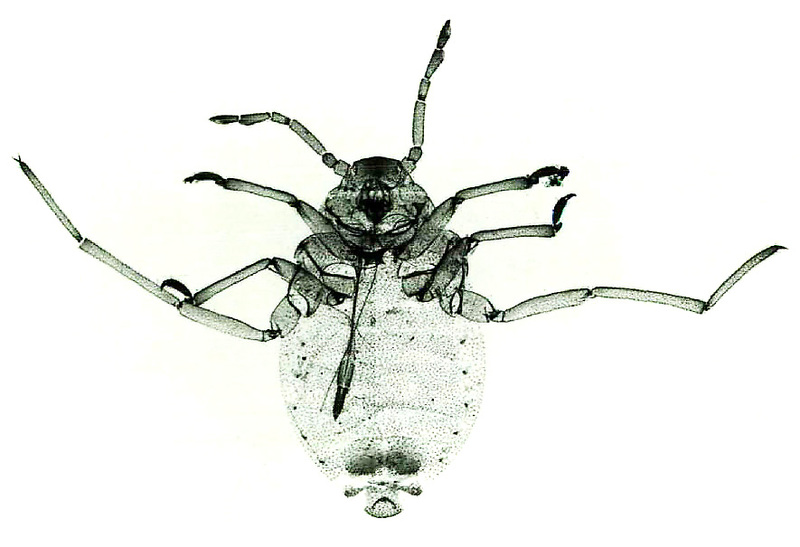 The most common is probably Aphis taraxacicola. We are extremely grateful to Maria Fremlin who sent us both living and preserved specimens of Trama rara from colonies she found on dandelion roots in allotments in Colchester, Essex. Hille Ris Lambers, D. (1969). 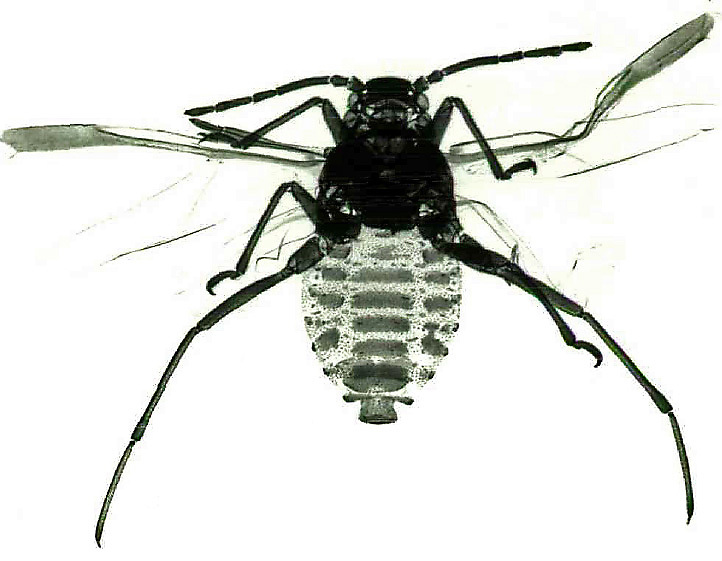 A new species of Tactilotrama Börner 1950 (Aphididae, Homoptera). Boll. Sed. Accad. Gioenia Sci. nat. 9(10), 657-66l. Nixon, G.E.J. 1951. 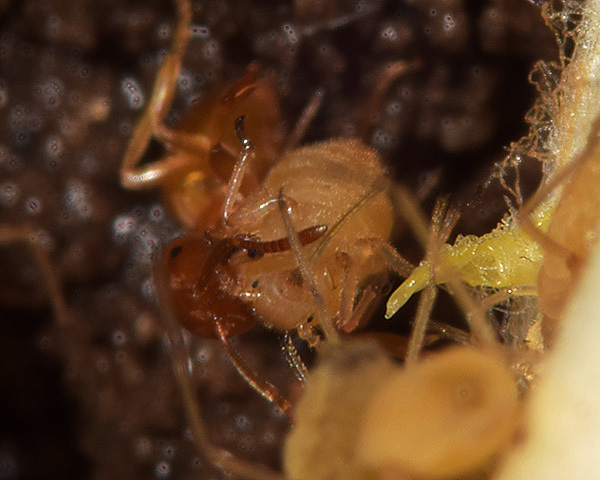 The association of ants with aphids and coccids. Commonweath Institute of Entomology, London. pp.36. Pontin, A.J. (1960) Observations on the keeping of Aphid eggs by ants of the genus Lasius (Hym., Formicidae). Entomologist's monthly Magazine 96, 198.